So we’ve got a few months experience with feeding wet distillers grain, and we’ve come up with a few things that make our lives a bit easier. 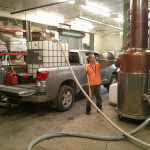 Picking up the grains from the distillery is pretty simple. We drop off an empty 275 gallon IBC tote, and they load a full tote in the back of our truck with a forklift. 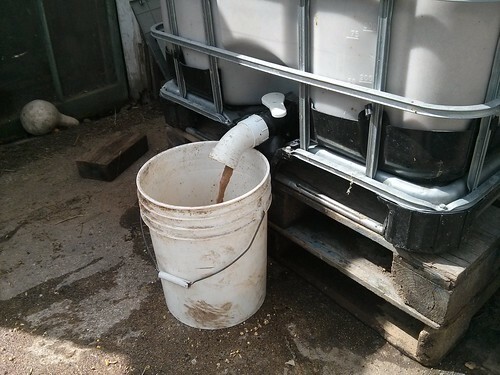 At home we have a bigger 325 gallon IBC tote for a “holding tank” that we transfer the newly-gotten grains into. This keeps us from having to lift a full 1-ton tote out of the truck with the front-end loader of the tractor. 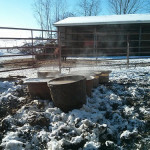 So far we’ve been feeding the distillers grains mixed with cracked corn. 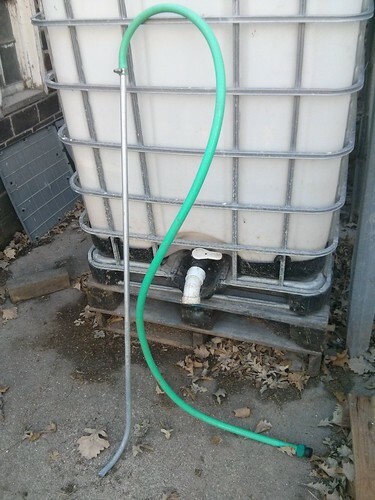 We have the “holding tank” up on two pallets, the perfect height to get a 5-gallon bucket underneath. A bucket usually gets about 2/3 distillers grain and then topped off with cracked corn. No need to mix, just pour it in the trough. 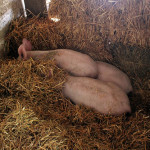 The pigs take care of the mixing as they root through it trying to hoover up all the corn first. 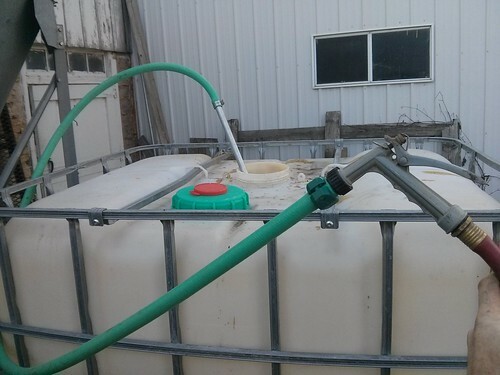 Anyway, to transfer the grains from the “pickup” tank to the “holding” tank we connect a 2″ suction-hose to the valve on the bottom of each tank and let gravity do the rest. Keep in mind that the “pickup” tank is on a pallet in the bed of our truck, a good 3′ or so off the ground, plenty of room for gravity to work it’s magic. In reality the bigger particles of grain tend to settle to the bottom of the tank. Those bigger particles have a nasty habit of clogging up the valve and/or hose, bringing the whole gravity-assisted transfer to a grinding halt. We’ve tried lifting the pickup tote higher (to increase the hydraulic head) with the tractor. We’ve tried blowing compressed air into the pickup tote to push the grains through with pneumatic pressure. None of it works very well. This is the best option we’ve come up with so far. 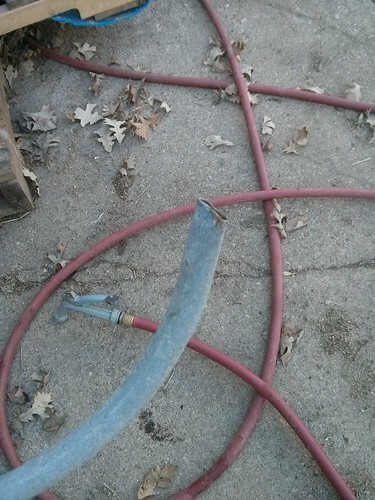 It’s a leftover scrap of 1/2 EMT conduit attached to a leftover scrap of garden hose. Very fancy. We smashed the end of the conduit flat-ish with a hammer. To use this very fancy piece of equipment, just stick it down into the full tote of grains with the smashed end pointing toward the valve. Attach it to the spray-handle of your regular garden hose and let ‘er rip. By constantly adding a little bit of water right around the valve, where the grain tends to plug up, it keeps it all flowing quite nicely. 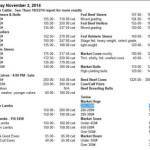 Adding water to the grain mix will result in a little more volume, but after a day or so of sitting in the holding tank the grain will have settled out again, and the excess water can be siphoned off or drained out. While this is working out pretty well for us right now, we’re quickly approaching the time of year that this will no longer be feasible. I don’t want to be fooling around spraying water everywhere when it’s well below freezing outside. I’m looking into unloading the totes straight into troughs for the winter months, bypassing the holding tank completely. Without water to aid in the unloading process I think I’ll have to bite the bullet and buy a trash-pump to facilitate the transfer. Bad Stock Tanks, Good Stock Tanks. 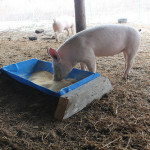 Great idea Andrew, hope I can find a free source of grain like this when I start raising hogs. How will you keep it from freezing this winter when you drive back to the farm with the grain? We’ve just recently moved to our farmhouse where we plan to raise our kids to be farm kids. I’ve decided to have chickens and study how I can manage to take care of them properly. It’s nice to learn that there some issues that I could face with grain handling since the large grains tend to clog the tubes as you’ve mentioned. I’ll be sure to have this all worked out just as you did. If I can’t do it myself, I’ll probably have some professionals help me learn how to do proper grain handling maintenance. Thanks!